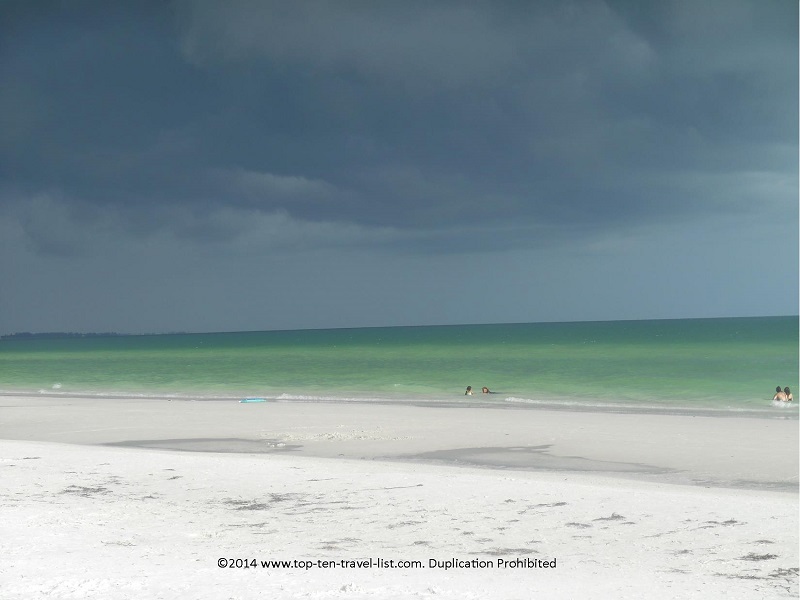 6 Beautiful Beaches in Sarasota & Venice, Florida - Top Ten Travel Blog | Our experiences traveling throughout the US. Florida’s Southwest Coast is known for being home to some of the most gorgeous beaches in the country. 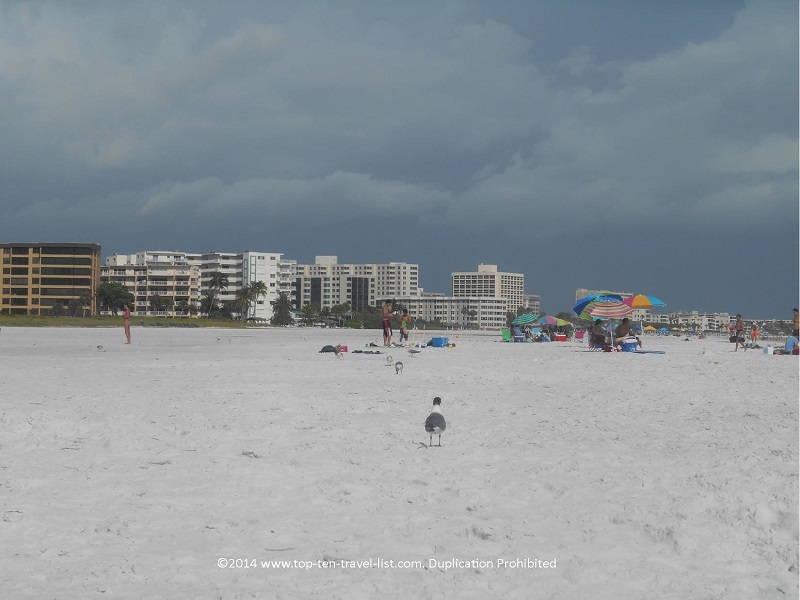 Unlike the congested Tampa area, Sarasota and Venice offer a less hectic atmosphere and an all around more leisure oriented, beachy vibe compared to the Tampa Bay area’s business vibe. The beaches are much quieter, and more scenic. They also all offer free parking, which is a huge benefit over Tampa area beaches, where parking is expensive and oftentimes near impossible to find. As an added benefit, there is less commercialization surrounding the beaches. You will need to drive to get to the restaurants and shopping areas, although you benefit by having a quieter beach experience. 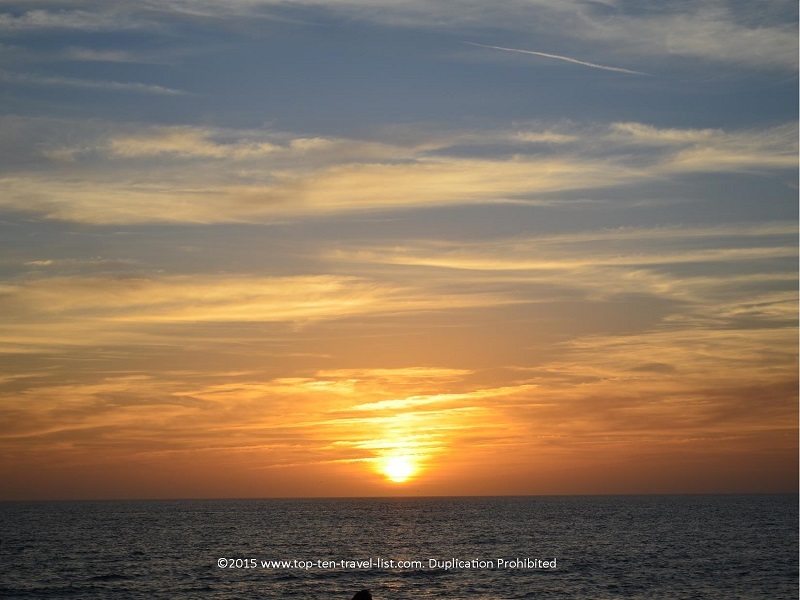 A vacation to the Sarasota area is perfect for anyone looking for more of a laid-back beach vacation. Here you will find less traffic, fewer strip malls, and more beautiful landscaping and architecture. It has more of that Old historic Florida feel, rather than a modern suburban feel. There are many great beaches to choose from on your trip. Below I have listed 6 must-see options in the area. Each of these beaches offer a slightly different atmosphere. 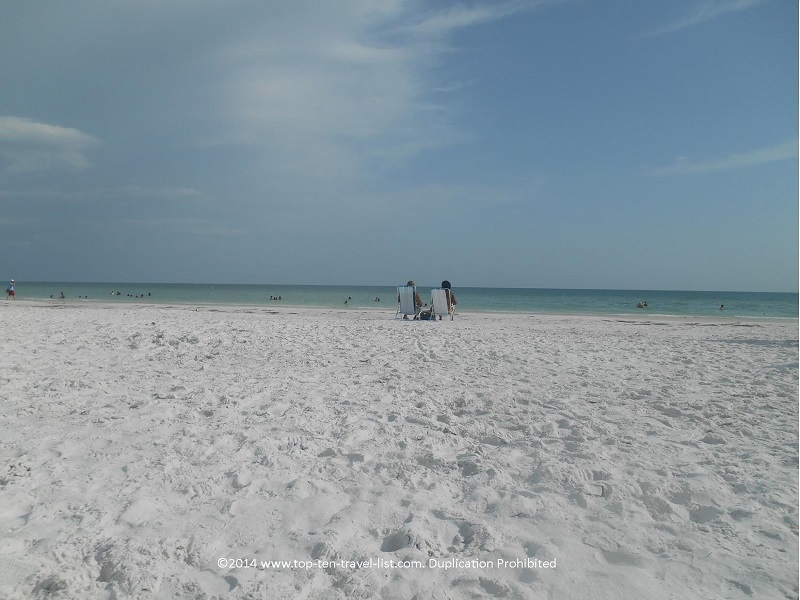 Whether you are looking for soft sand, beach combing, a great sunset, or just a laid-back beach day, there is a beach waiting for you in Sarasota. Feel free to share some of your favorites in the area in the comments below. 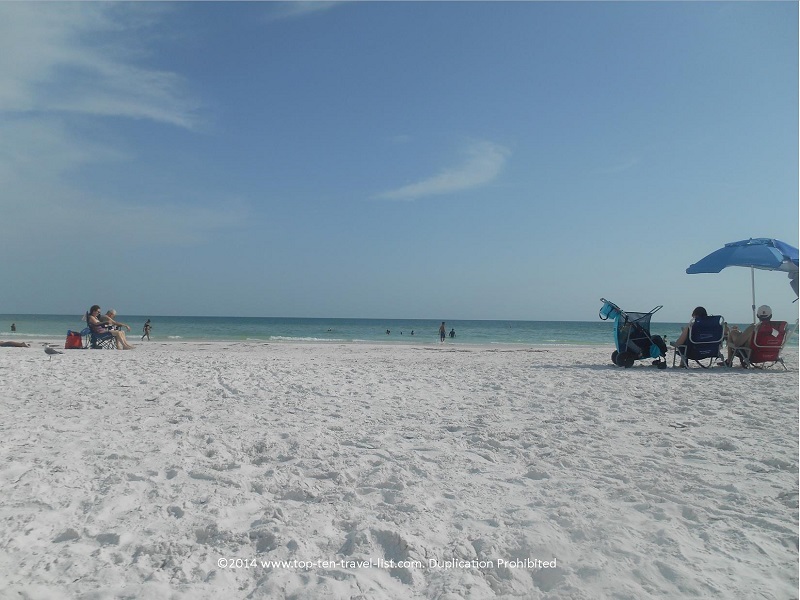 Siesta Key should be tops on your list. 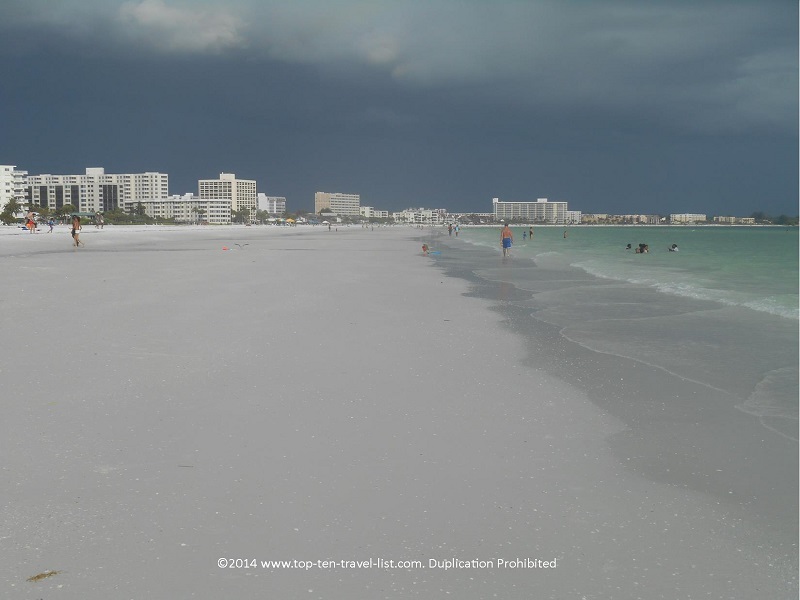 Not only is it one of the best beaches in Sarasota, it also is one of the best on the Gulf Coast! This gorgeous wide, sandy beach features 99% pure quartz sand. The soft sugar white sand will make you want to dig your toes right in, so park your beach chair and enjoy a relaxing, carefree afternoon. Or visit at sunset for gorgeous photo opportunities. If you are looking to get more active, Siesta is one of the few beaches in the area which offers sand volleyball. Why not enjoy a little healthy exercise while taking in the magnificent views around you? And the sand doesn’t get hot, so no need to hop around to try to cool your feet down. Not a volleyball player? Tennis courts are also available. Here you can enjoy an invigorating game, followed by a little R&R on the beach. Or simply walk for miles and enjoy the crystal clear water and feel of the smooth sand under your feet. The sand at Siesta is 99% pure quartz – completely smooth to the touch! Another view of Siesta’s famous soft, powdery sand! The beach is very clean without any garbage in sight. Crowds are hefty on the weekends during the winter season, but never as congested as the Clearwater/St. Pete beaches. And another big plus: parking is always available unlike other beaches where you have to drive around looking for a spot to open. 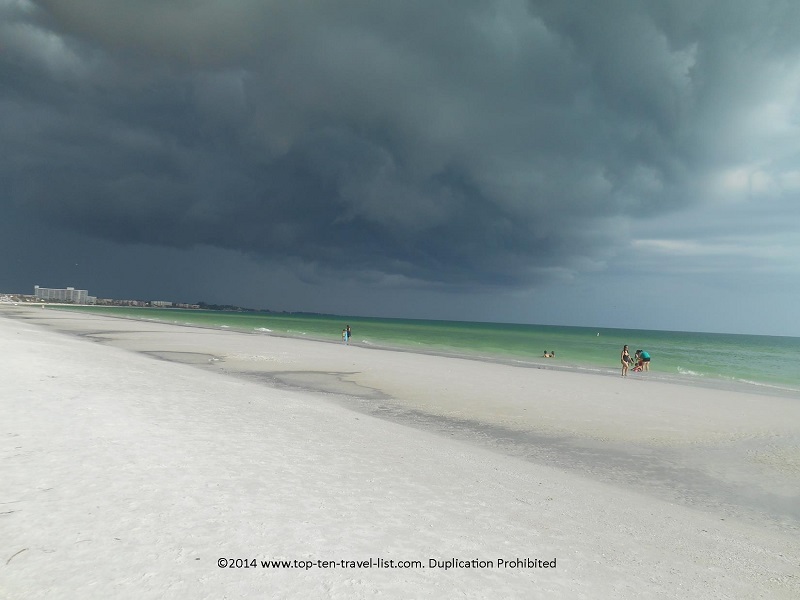 Siesta Key right before a summer storm.